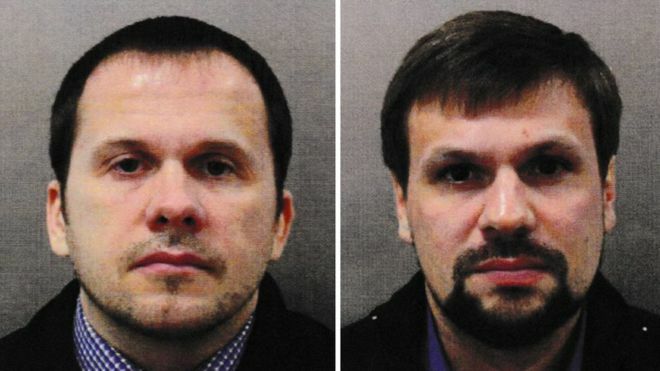 The suspects in the Salisbury Novichok poisoning case are two Russian nationals called Alexander Petrov and Ruslan Boshirov. They are straight out of central casting. Theresa May says the mean are Russian spies. The Met police says there is “sufficient evidence” to charge Petrov and Boshirov with the attempted murder of former Russian spy Sergei Skripal hi,s daughter Yulia and Det Sgt Nick Bailey in March. 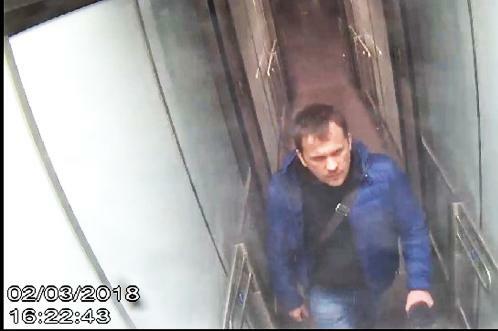 Although Petrov might not be Petrov and Boshirov might not be Boshirov – chances are the middle-aged men were using aliases. If the men are in Russia, the UK will rely on good will and a sound sense of right and wrong for the Russian authorities to send the men here for questioning. The Russian foreign ministry has seen the news and responded by shrugging and saying the suspects “do not mean anything to Moscow”. But they do mean something to the families of Dawn Sturgess and Charlie Rowley, who fund a vial of ‘perfume’ in a charity bin around 8 miles from Salisbury and tried it on. 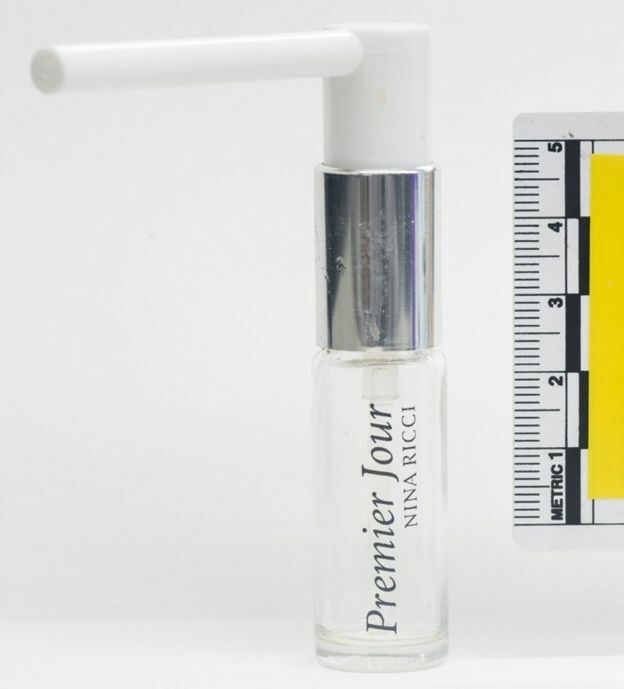 The liquid in the perfume bottle labelled Nina Ricci Premier Jour perfume was Novichok. Ms Sturgess died. Mr Rowley was hospitalised. The Metropolitan Police said the two men had arrived at Gatwick Airport from Moscow on 2 March and stayed at the City Stay Hotel in Bow Road, east London. Both travelled on passports issued by the Russian government. From there, they travelled to Salisbury on 4 March where Mr Skripal’s front door was contaminated with Novichok. Officers believe a perfume bottle was used to spray the door. Dame Sally Davies, the head of Public Health England, said that the wanted pair used the London Underground, Aeroflot flights and the South Western rail service. They arrived at Gatwick airport at 3pm on Friday 2 March, having flown from Moscow on an Aeroflot flight. It is believed that they travelled by train into London, arriving at Victoria station at about 5.40pm. They then travelled on public transport to Waterloo station and then travelled to the City Stay Hotel in Bow Road, east London, where they stayed the night. On Saturday 3 March, the two men left the hotel and took the underground to Waterloo station, arriving at 11.45am. They then caught a train to Salisbury whey they arrived at 2.25pm. Police believe this visit was for “reconnaissance of the Salisbury area”. The two men left Salisbury at about 4.10pm and arrived back in Bow in east London at 8.05pm. On Sunday 4 March, they made the same journey from the hotel, again using the underground from Bow to Waterloo station at about 8.05am, before continuing their journey by train to Salisbury. CCTV shows them in the vicinity of Mr Skripal’s house and police believe that they contaminated the front door with novichok. They left Salisbury and returned to Waterloo station where they arrived at about 4.45pm. They then boarded the London Underground to London Heathrow airport at 6.30pm. From Heathrow airport, they returned to Moscow on an Aeroflot flight, departing at 10.30pm on Sunday 4 March. One rail replacement service (aka: the bus) and the whole thing would have been scuppered.